Julie Goell passed away December 12, 2016. Article about Julie’s life and work. Julie’s music. Julie played bass, mandolin, and sang with the Casco Bay Tummlers Klezmer band for over 25 years. Obituary in the Portland Press Herald. A memorial concert celebrating Julie, her life, and her work was held on June 16, 2017. 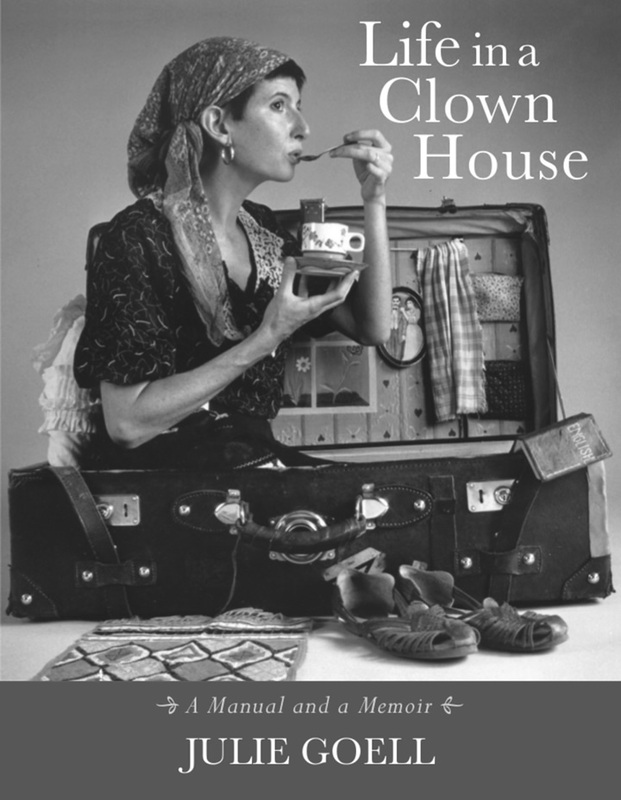 Life in a Clown House: A Manual and a Memoir is an invaluable resource for both professionals and aspiring clowns. The first part of the book, The Manual, presents the Eccentric Principles, the core of the pedagogy she and her husband, Avner Eisenberg have developed and refined in over 25 years of teaching together. It all begins with the breath, and quickly moves into entrance onto the stage and the creation of the world of the clown. This is not the clown of the circus, but rather the clown that finds problems to solve at every turn. Even entering the stage is a problem to be addressed. Armed with this new approach, the reader is guided into a careful study of relationships with partners, place, and props. 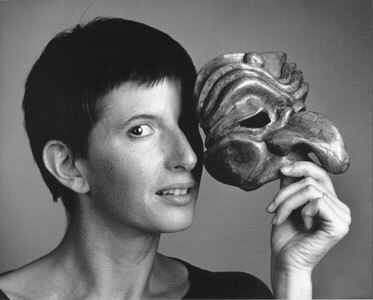 Having spent her formative years living and training in Italy, Julie brings a keen appreciation of the Commedia Dell’Arte to her practice of clowning with exercises from both the historical literature of Commedia and from her vast experience as a performer. The second part of the book, The Memoir, tells the stories of Julie’s days as the Clown of Piazza Navona in Rome, Italy, her extensive touring throughout Europe, and founding one of the first mime troupes in America. Following these early stories is Julie’s account, told with poignancy, humor, and grit, of confronting and living with a debilitating neurodegenerative condition. Life in a Clown House also includes a delightful photographic retrospective of Julie’s career as an actor, mime and musician. A sharp, succinct, and invaluable, An Actor Prepares, for aspiring clowns. Juilie Goell inspires me to embrace the moment—whether it be on stage or in life. Life in a Clown House unpacks a magical trunk of intriguing techniques and exercises. While you are waiting for your book to arrive in the mail, check out Julie’s poems. Julie Goell has degrees in directing and jazz stand-up bass, and is a certified teacher of Somatic Voicework™. She is the creator and performer of two one-woman shows, Woman in a Suitcase, and Opening Night Carmen: A Mopera, both of which have toured worldwide. 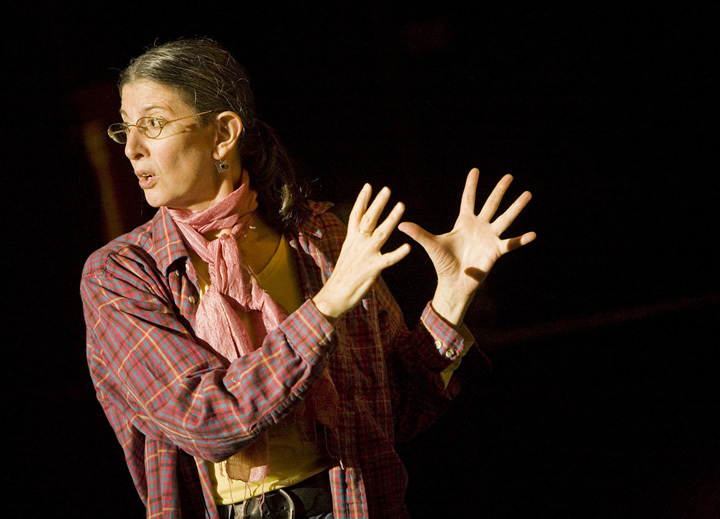 She recently created and directs Peaks Island Puppets, and directs the Maine Singers Atelier. In a career spanning over five decades, she has performed and taught throughout Asia, Europe, South America, and the US as a actor, clown, comedian, designer, director, mime, musician, puppeteer, and singer.